While detouring through the Vintage Aircraft circle at the Red Barn, Storm and I strike up a conversation with Bob. 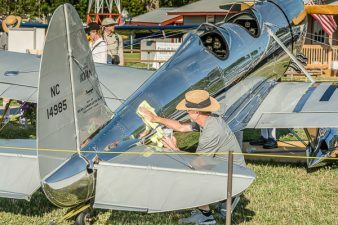 He is one of the skilled aircraft mechanics who helped restore the 1936 Ryan ST/STA which won the Antique Champion Gold Lindy at EAA Airventure 2016. Storm and I fall in love with this World War II P-47 Crew Chief and I am sure that you will too. I am so sorry I missed that! I did get a picture of the Thunderbolt though, if you want it. I hate you missed him too – what a treat! I would love the thunderbolt picture, Thanks! I will not make age an issue of this campaign. my opponent’s youth and inexperience. the remark may have been the turning point in the presidential election).